There is a fee of $9 per person to enter the Indian Canyons, which open at 8 a.m. and close at 5 p.m. There are bathrooms and picnic tables at the entrance for public use. When hiking in the desert, always make sure to bring as much water as you can carry, as well as sunscreen. Be aware of signs of heat exhaustion and stroke. 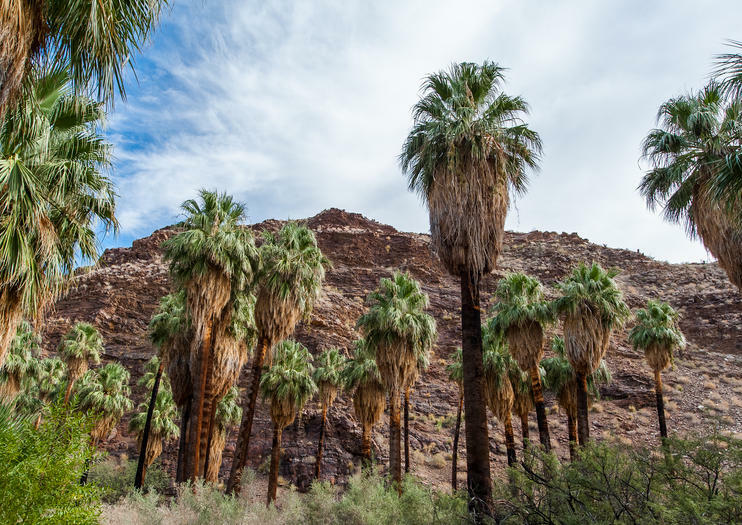 Go deep into Palm Springs’ Indian Canyons on a 3-hour, small group Jeep and hiking tour to the ancestral home of the Cahuilla tribes. Take in views of the rugged desert landscape as you ride into the rocky canyons, and learn the rich history of the Cahuilla; take a 1-mile (1.6-km) walk along a palm-lined stream to see the traces of historic Native American settlements. Visit a shady desert oasis, walk to a seasonal spring and browse a tribal trading post, then finish the tour at your Palm Springs hotel.